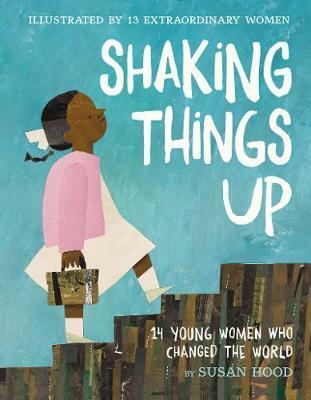 Fresh, accessible, and inspiring, Shaking Things Up introduces fourteen revolutionary young women-each paired with a noteworthy female artist-to the next generation of activists, trail-blazers, and rabble-rousers. And those are just a few of the young women included in this book. Readers will also hear about Molly Williams, Annette Kellerman, Nellie Bly, Pura Belpre, Frida Kahlo, Jacqueline and Eileen Nearne, Frances Moore Lappe, Mae Jemison, Angela Zhang, and Malala Yousafzai-all whose stories will enthrall and inspire. This poetry collection was written, illustrated, edited, and designed by women and includes an author's note, a timeline, and additional resources. Susan Hood is the author of more than two hundred children's books, including Ada's Violin, the 2017 winner of Bank Street's Flora Stieglitz Straus Award, given annually to "a distinguished work of nonfiction which serves as an inspiration to young people," and the acclaimed Shaking Things Up: 14 Young Women Who Changed the World. Visit her at www.susanhoodbooks.com. Sophie Blackall is the illustrator of many acclaimed picture books, including Finding Winnie, for which she received the Caldecott Medal, one of the most prestigious children's book awards in the world. Her artwork has also appeared in murals as part of the New York City MTA's "Arts for Transit" program. She lives in Brooklyn, New York. Julie Morstad is the author and illustrator of Today and How To. She has illustrated many books for children, including Swan, The Dress and the Girl, This Is Sadie, and Bloom: A Story of Fashion Designer Elsa Schiaparelli. Julie makes her home in Vancouver, British Columbia, where she lives with her family. You can find her at www.juliemorstad.com. Sara Palacios is the recipient of the 2012 Pura Belpre Illustrator Honor for her work on Marisol McDonald Doesn't Match/Marisol McDonald no combina. A native of Mexico, Sara graduated from the National Institute of Fine Arts in Mexico City with a degree in digital graphic techniques and went on to earn BFA and MFA degrees in illustration from the Academy of Art University in San Francisco. She works with a variety of media such as collage, ink, and digital artwork.